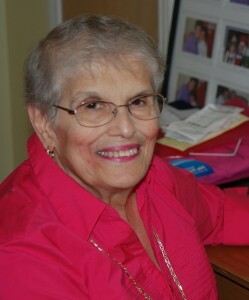 Dolores is 79 years old with an easy smile and an indomitable spirit. I came to know her when she sent me a thank you letter praising Second Sense staff members. Her letter was so heartfelt and effusive that I had to meet her. Her house is one of those places that is warm, well-cared for and has seen many years of laughter and love. It’s like your grandmother’s house. As we sat and got to know each other her story began to unfold. Dee had a rich and happy life with her husband of 52 years. They had three healthy children, who eventually married and blessed them with seven wonderful grandchildren. Life for her was good. Then one September morning three years ago, her world changed. Her husband was diagnosed with stage-four cancer and within two months he was gone. Dee was devastated. She didn’t know how she would get along without him. But Dee’s troubles did not end there. Eight months later, her ophthalmologist told her that the blurry lines she was seeing were the result of macular degeneration, the most common form of blindness for seniors. He told her it would continue to get worse until she would be unable to drive, read or even recognize the faces of her grandchildren. There was nothing that could be done, he explained, and then he left the room. Dee was overwhelmed and felt her world spinning out of control. She had so many questions with no answers and no one to ask. Dee participated in a variety of Second Sense training programs. 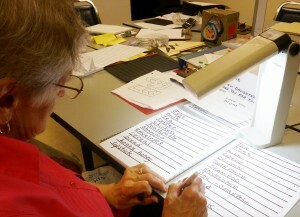 Polly’s handwriting class helped Dee learn to slow down, write bigger and use more spacing. She learned to use an electronic magnifier (purchased for her by a generous donor) to read her mail, take care of her finances, apply makeup and do a multitude of chores. The most intense was mobility training, where Dee learned to use a white cane to identify her environment. She was taught how to use her remaining vision and other senses to take note of her surroundings, including identifying traffic patterns to make crossing intersections safe. After 30 hours of individual instruction, Dee was able to go places that had been impossible for her to go to alone, such as a dimly lit school auditorium to see her grandchild’s play and restaurants to have lunch with friends. When one of Dee’s dearest friends fell ill, we were able to send our mobility instructor to Dee’s hometown to help her plan a safe route to her friend’s home. And, when Dee needed help with a major initiative – to launch and lead a new low vision support group in Des Plaines – Polly was the first person she called. Then, about a month before the first meeting, the library staff told her they could no longer help. Dee didn’t know what to do. She didn’t feel qualified to lead the group alone.